Calorie is a term that gets used ALL THE TIME, but do you really know what a Calorie is? What about that old saying "Calories in = Calories out"? Is that true? 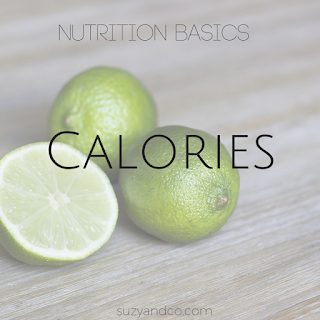 I am going to give you a basic definition of what Calories are so you can better understand how to balance out the foods you eat. Having balance will create a healthier you and elevate your wellness. A Calorie measures units of energy. Every chemical reaction that happens in our body gives off energy in the form of heat and that is measured in Calories. When a lot of reactions are happening, they “burn off” a lot of heat. So when you think about exercising and how it burns Calories, it really means that there are a ton of chemical reactions happening in your body, much more than at rest and all of those chemical reactions give off heat. To expel that heat from the body, our breathing increases, our circulation increases and we sweat. Every day, every hour, every minute, there are chemical reactions taking place in your body that use up energy and expel heat. Not just when we exercise. In order to replace what is lost and get more Calories for future chemical reactions that will take place, we need to eat and obtain Calories from food. You can look on any nutrition facts label and see how many Calories a food contains. But if you are wondering how they know that food contains that particular amount of Calories, here is how they figure it out (in a very simplified explanation). So food has Calories, but a piece of food is not going to give off heat. They actually have to set a food on fire to figure out how much heat it can give off. To figure out how many Calories are in a food, they use something called a bomb calorimeter. It is a chamber with water all around it. They burn the food and measure the changes in water temperature. One Calorie equals is the amount of heat it takes to raise the temperature of one gram of water 1 degree celsius. Yep! They burn the food and take measurements. A lot more goes into the actual determination than that. If you wanted to read a long detailed explanation of how it is actually done, here is a great article with lots of chemical equations. Calories are found in carbohydrates, fats, protein and alcohol, but not vitamins or minerals. For a refresher on these, read about the basics of nutrients. So Calories in equals Calories out? This is a very antiquated saying. It is just not that simple. Just because you eat 100 calories, it does not mean you will digest and absorb all 100 calories. There is a lot that has to go on in your body to extract calories from food. Your body has to break down food into it's smallest units, transport it out of the digestive system, shuttle it to the liver to process, shuttle it through the blood, take it to tissues, and then those tissues have to take up the nutrients to utilize them. It just is not a 100% efficient process. We all have off days and even your digestive system can as well. So although knowing about Calories is important and being aware of how they work can help you maintain a healthy weight, it is much more important to focus on food quality and hunger cues rather than how many Calories a food has.